If, no matter how hard you try and how much TLC you give to your thirsty tresses, your ends just keep on splitting, this is a post you’ll want to read. For those of us who use straighteners and curling irons on the daily and spend the extra hours trying to shield our hair with all the right products, it can still seem like the battle of the split end is one that we will never win. But when desperate times call for desperate measures, spending more money on yet another expensive product isn’t likely to do the trick. Instead, it can help to address the preventative aspect of hair care — by taking a closer look at how you handle your daily styling routine. I am 100 percent positive that the importance of hygiene can go unsaid. Of course we want you to shower! But, sometimes tossing your hair in a bun on top of your head and just hopping in for a quick body shower is perfectly fine and actually very healthy! Washing hair every other day allows the body to repair hair with its own natural oils — leaving your hair silky, smooth and protected. You might even be surprised to find that some styles will work better with second- or even third-day hair. First, pick the type of brush you use wisely — for daily brushing, choose a cushioned paddle brush with flexible bristles. This will work with your hair to detangle with ease. Be careful — hard plastic brushes and bristles will tug and rip your hair apart if used for normal daily brushing on knotted hair. 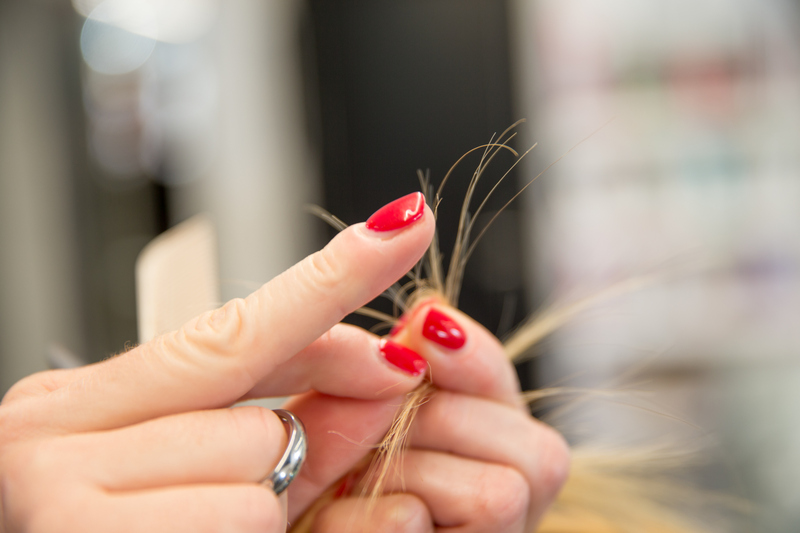 Next, use it correctly — absolutely do not pick up your brush and tug it down your hair from root to tip on your first pass through! Doing this will instantly push every nominal crisscross down into a tangled clump at the ends of your hair! Now your delicate ends are forced to take on the heat of a brush yanking through thick, concentrated knots. This is an incredibly easy way to damage hair! Instead, work from end to root. Carefully brush through your ends first, then slowly work up to the midsection. In a final stroke, you can pull your brush through the entire length of your hair. Do not clump all of your hair into a big pile on top of your head and begin to scrub. This unnatural bending and rubbing of your hair will aid the development of split ends. Instead, let hair hang down normally and simply lather shampoo onto your scalp, then let the ends of your hair experience the “second hand suds” as you rinse the shampoo through your hair and away down the drain. As McKellar and Hills just explained, regular product use is non-negotiable if you want to keep ends from splitting, especially when it comes to styling with heat (more on that later). “Always use product! When heat styling make sure to use a thermal protectant. When air drying, using a leave-in conditioner or moisturizing oil will help nourish your hair and also create a barrier to protect it from the elements,” says Senior Stylist Jill Franchi at Pyara Spa & Salon. Do not scrub and rub a towel every which way on and through your hair! Those wet and vulnerable hairs are then forced to crease and twist in many unnatural directions, thus promoting more breakage. Instead, wrap a towel around hair and simply squeeze different areas to draw moisture out.